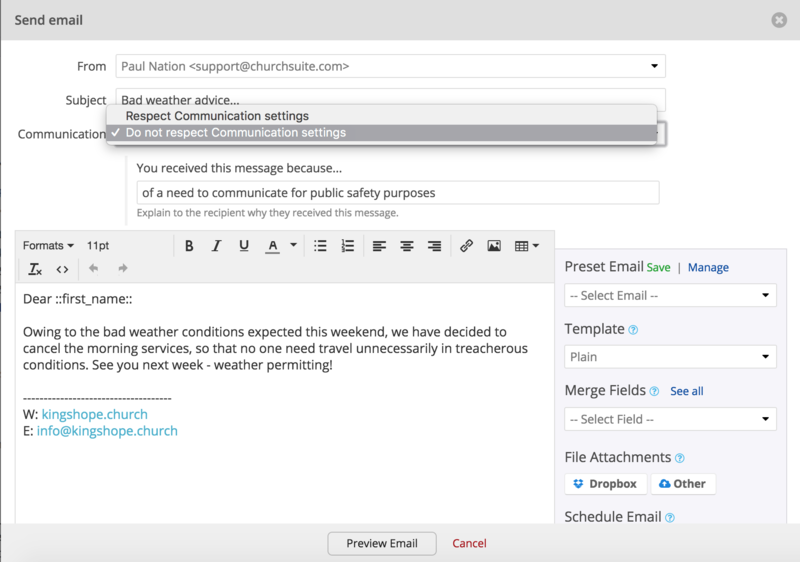 ChurchSuite makes it easy for church members to manage their own communication options, and for those options to be respected by default whenever a user sends a communication through ChurchSuite. It's also possible for a user to override people's communication options when appropriate. Communication options should not be confused with mailing list preferences - communication options are about perople's preferred communication methods - by email, SMS, phone and post. 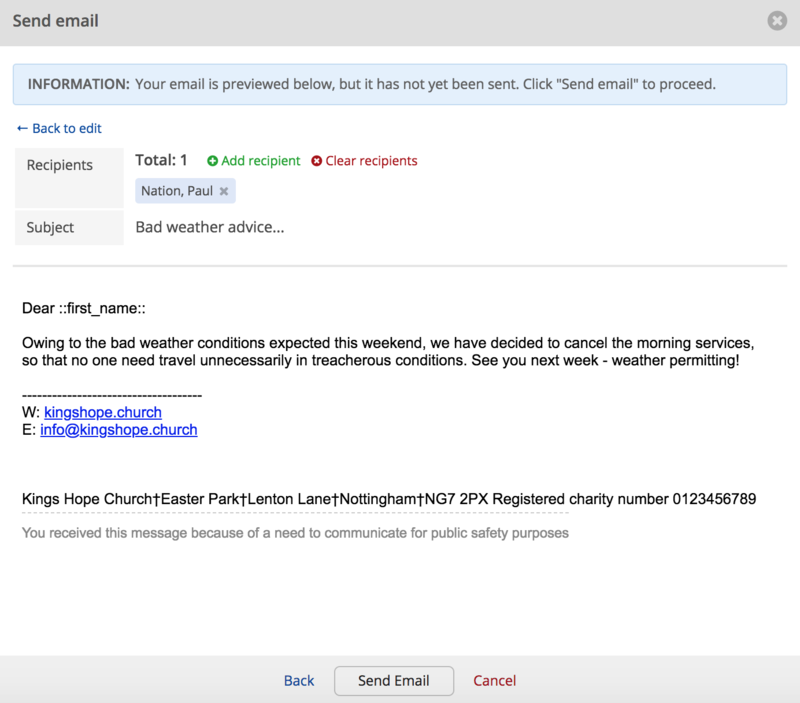 For email/SMS communication options, ChurchSuite distinguishes general emailsSMS from rota reminders, giving people a way of opting out of receiving rota reminders but still receiving your other church emails, or vice versa. Apart from communicastion options, you can use custom fields and smart tags to maintain your organisation's various subscriber lists. To review the default communication options for new contacts and children on your account, head in to the Address Book module's options (and also the Children module's options) by clicking the cog icon in the top right corner of the module. Navigate down the list of module options to the Communication options. 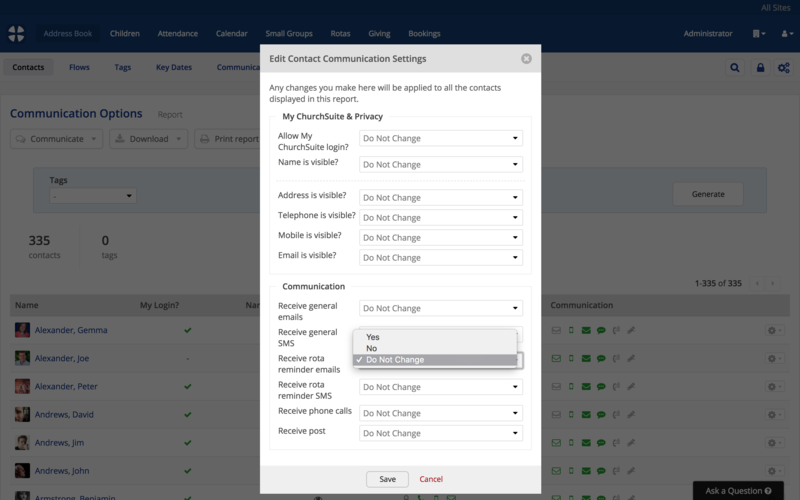 Here you can set the default for new contacts and children - checking the box next to each option will set the default to "opted in" to receive each communication type. Save any changes to your module's options before navigating away from the page. 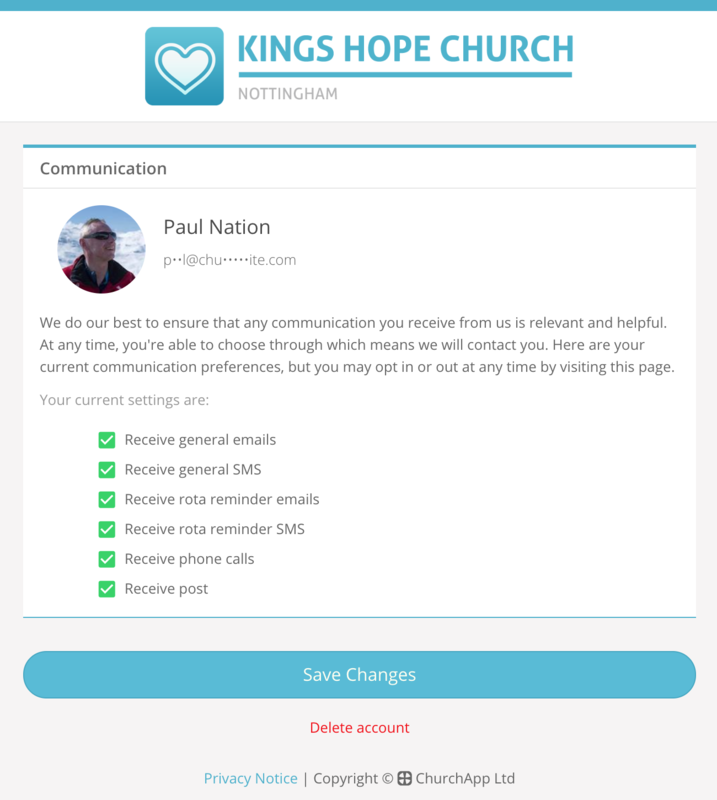 ...This can be helpful for church members that are unable to manage their own communication options - perhaps if they don't have access to My ChurchSuite - a User is able to edit a person's profile and update the communication options in accordance with the person's wishes. A Changes log is maintained detailing who made the changes - a user or the church member - and a note of what was changed and when. Note: The "Receive rota reminder emails/SMS" option, while visible on a contact's profile page in ChurchSuite, will only be visible to the contact/child if they are part of a ministry in the Rotas module. If they are not a ministry/rota member, they will not have the option to opt in or out of receiving rota reminders within My ChurchSuite. As explained in the Introduction, ChurchSuite distinguishes rota reminder communications from all other general church communications. 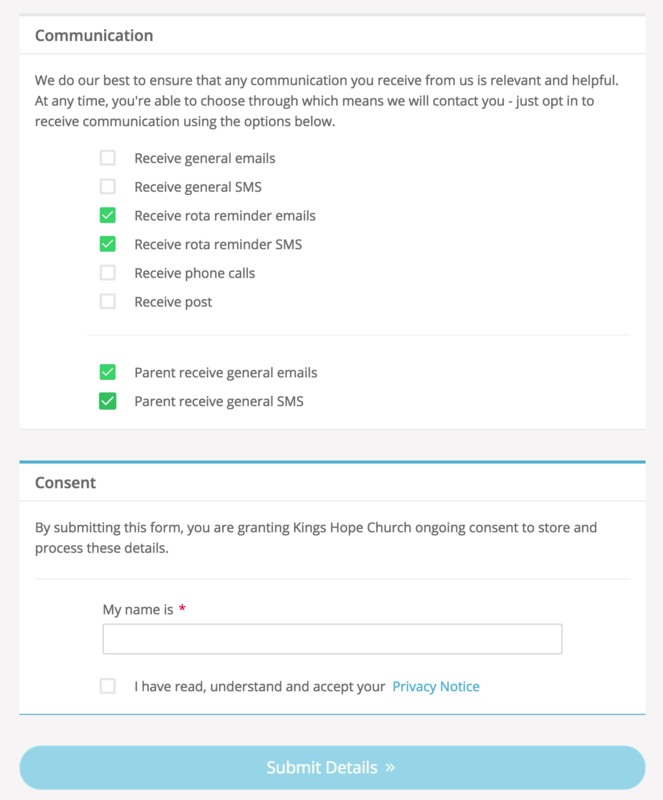 In this way, church members can opt in or out of each communication type independently, perhaps choosing to receive your general emails, but not receive rota reminders. 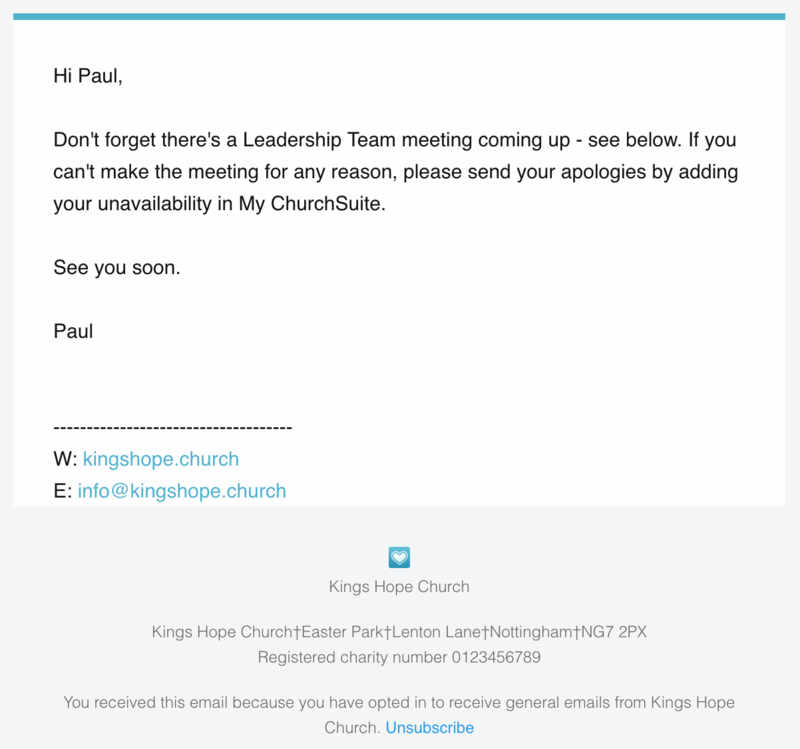 General emails/SMS are any communication sent by a User from within your admin-facing ChurchSuite system. If "Receive general emails/SMS?" is set to "opted out", the message is not sent to that person. Success/confirmation emails e.g. when an online form has been submitted by a church member. If required, you can easily make bulk changes to communication options for multiple people using the Communication Options report in the Address Book > Reports section (and Children module > Reports section) - see the related support article for further information about how this works. ...and those of their own linked children from the child's Communication page in the My Children section. 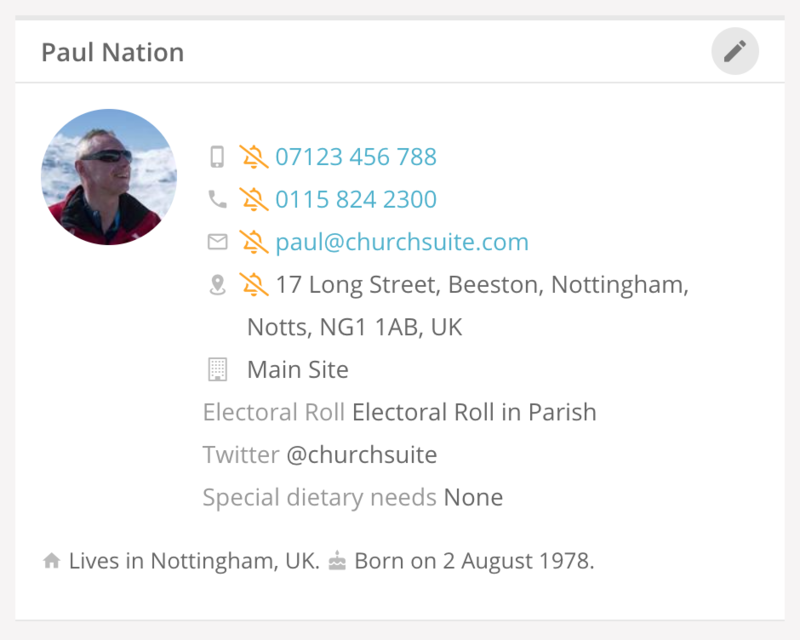 Church members can see a visual indication of the communication options when viewing their My Details section on their Home page within My ChurchSuite. Any opted out communication options are reflected by a strikethrough notification icon in front of the appropriate field. In the following example, this church member has opted out of receiving post, general emails, general SMS and phone calls. ...scroll down the My ChurchSuite Options to the Communication Message option. Here you can add your own custom text for the communication box - you should use language and terminology that is appropriate for adult contacts and children. Remember to save your changes before navigating away from the module options. When an email recipient clicks the unsubscribe link it opens their personal Communication page, allowing them to make changes, opting in or out of your various communication options; or to request their account in ChurchSuite be deleted entirely (see the related support article on Ongoing Consent for further information about how this functionality works). In this way, church members can manage their communication preferences at any time. 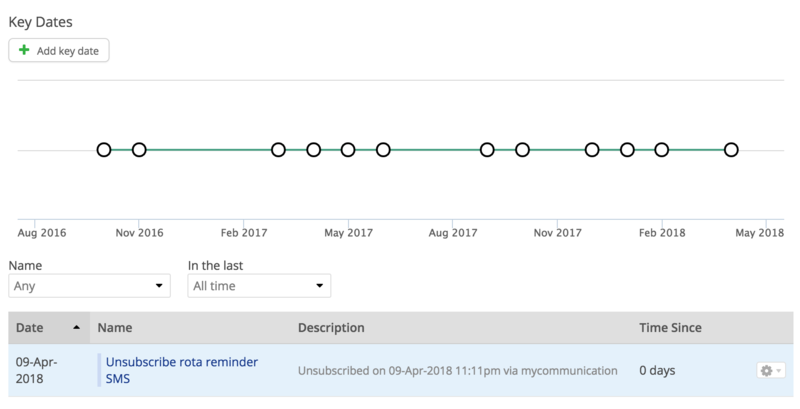 ...and a Key Date is added when they unsubscribe from a communication option. Finally, communication options can be used as conditions within Smart Tags - ideal for reporting a list of those who have opted in or out of certain communication options. 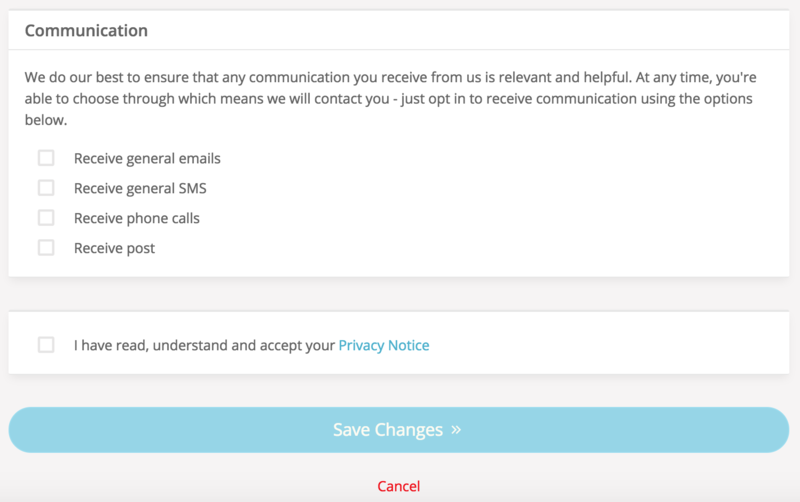 When sending an email or SMS from within ChurchSuite, a user has the option to override the communication options of recipients - perhaps where you have a compelling reason or a lawful reason that doesn't require opt in consent. When overriding communication options, the user is required to enter a "reason", which is added to the footer of the email being sent. The reason is also included in the "sent communications" log when viewing a sent email or SMS.